It's time for another state of the garden tour. This is my "glass half full" post after my woe-is-me "glass half empty" post last week about my travails with rodents. 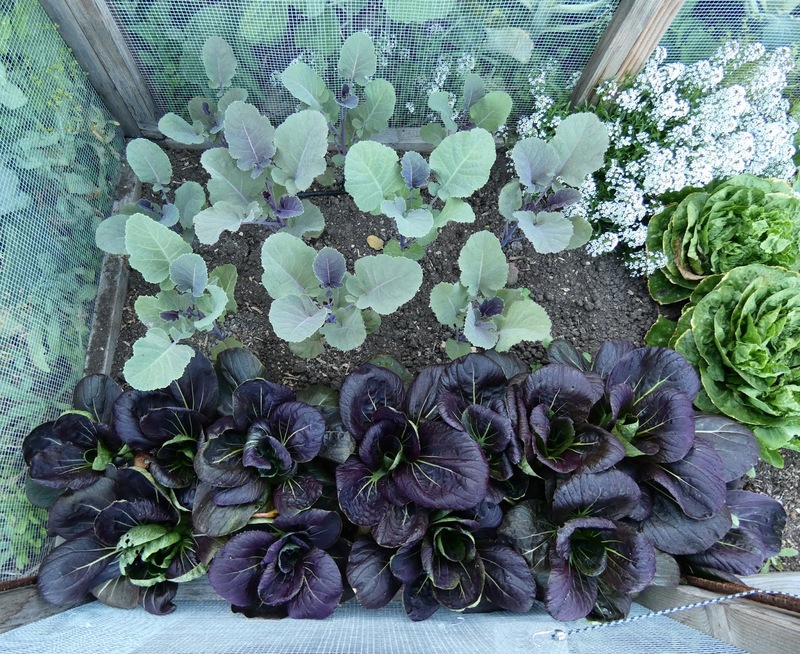 There are a number of things that I won't grow this year because of my fears of the rodents destroying them, but that doesn't mean I can't grow anything. As I mentioned in my post about my rodent woes there are number of things that I can grow so long as I protect them adequately. But first, there's a few holdovers from last year. 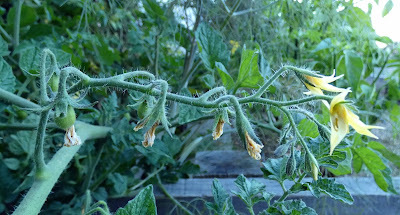 In the back are a couple of Piccolo Dattero cherry tomatoes. Those are possibly my favorite cherry tomato for the time being. 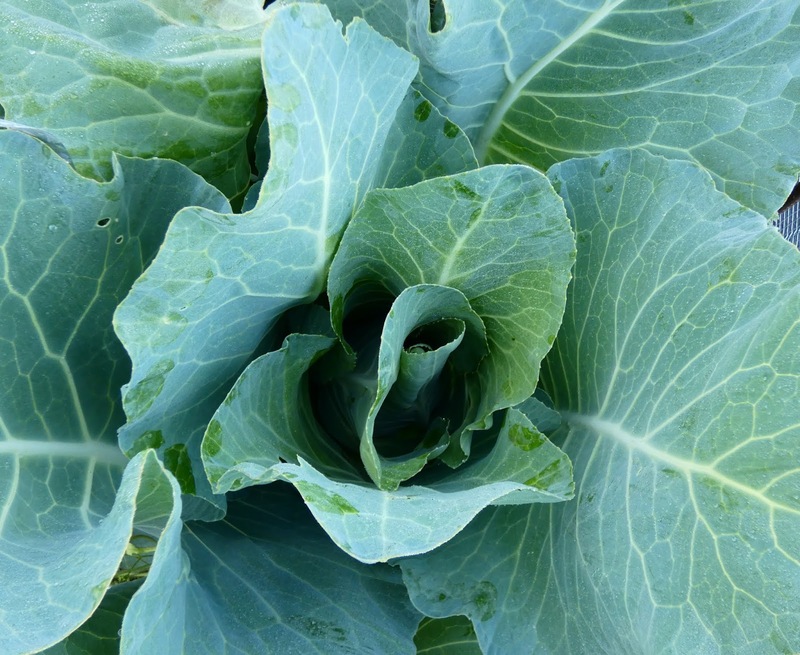 Being cold tolerant just adds to their charm but what I really love about them is that they taste great. Look, they already have flowers and baby tomatoes. But the real issue is how I will keep the you-know-whats from getting to them before I do. I'll deal with that later. 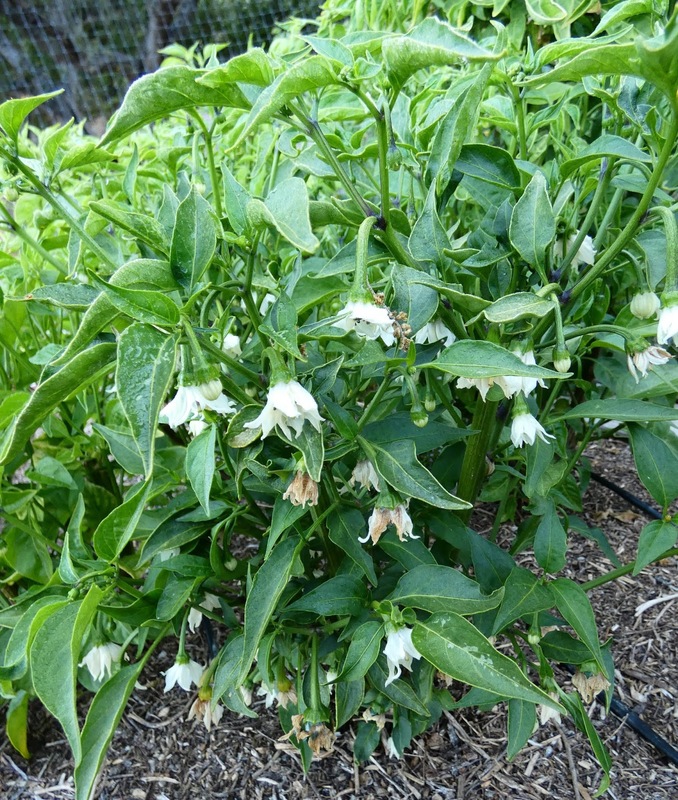 King of the overwintered pepper patch is this Craig's Grande Jalapeño. Loads of flowers. And they are setting peppers. I'm not too worried about the peppers, the DR's don't like hot peppers. Sweet peppers are another story. Elsewhere in this bed is one long lone row of Hank's X-Tra Special Baking Beans. It's a bush variety that I can grow inside a cage. 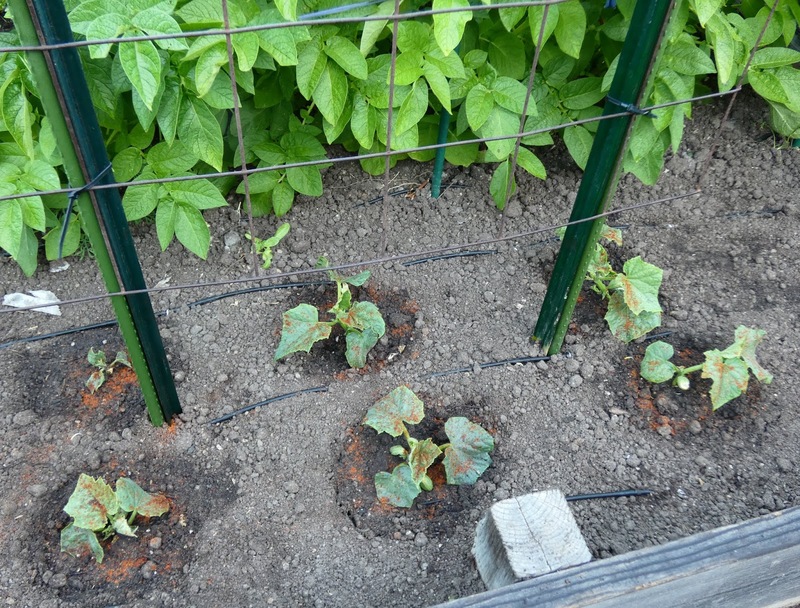 I had planned on keeping in place the trellis that had supported the tomatoes and growing pole beans on it. But I scratched that plan because I just couldn't face going out to the garden one morning and finding empty bean pods everywhere. That's what happened with the favas and I won't go through that again if I don't have to. Here's another planting of bush beans in a rodent resistant cage. Baciccia beans are from the central valley of California and seem to be something of a cult heirloom bean. The seeds are hard to come by, they're saved by the farmers who grow them and are passed around by friends and family but it seems there's no commercial seed source available to home gardeners. 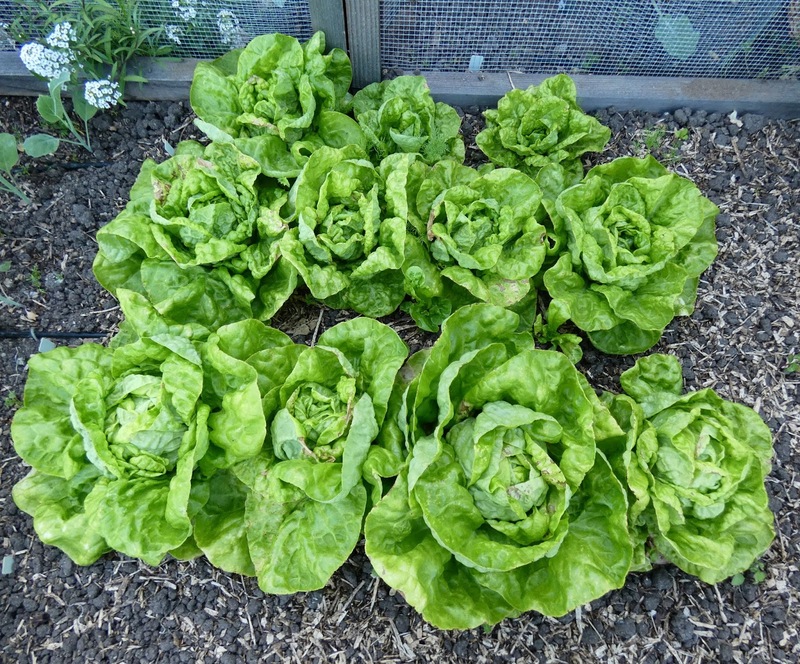 I got a few seeds from a friend last year (who got them from a friend, who seems to have gotten them from a mysterious source) and grew them out, harvesting just a few to taste (good!) and letting the rest of the beans mature to produce seeds. This year I hope to be able to enjoy more of the crop. And one last thing growing in this bed is a small patch of Pico Pardal Garbanzo beans. These are a small garbanzo (chickpea) from Spain and they are very different from the big chickpeas that are typically found here. You can see the pods that have set. I'm debating whether I should cover the patch to protect the maturing beans. For now I'm keeping an eye on them and the moment I see signs of munching I'll give them the hot pepper treatment and cover them up. Maybe I'll give them the hot pepper treatment anyway. There's a lot going on in Bed No. 2 at the moment. 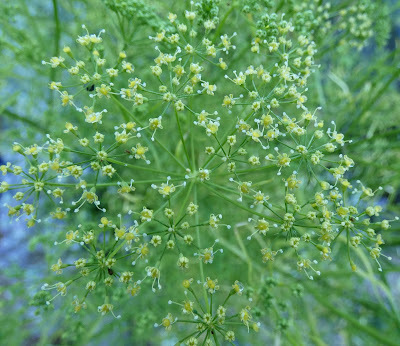 The corner seen below is full of Cilician parsley. The plan earlier this year was to have the parsley keep company with Batavia broccoli. 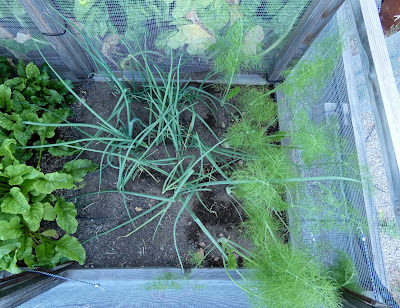 It was a great combo last year, the broccoli produced shoots for the entire year but didn't overshadow the parsley. 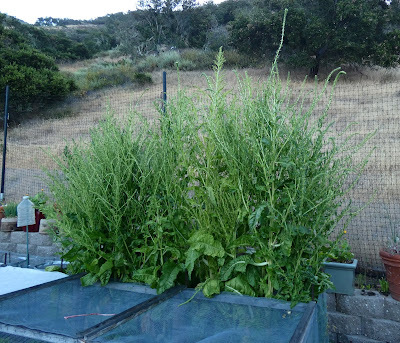 But the young plants were some of the first victims of the DR's this year and I ended up pulling them out to keep the critters from munching. The parsley is due for a trim, it seems to do best when I cut it back hard and then it rebounds with a lot of fresh tender growth. This variety of parsley is very resistant to bolting. 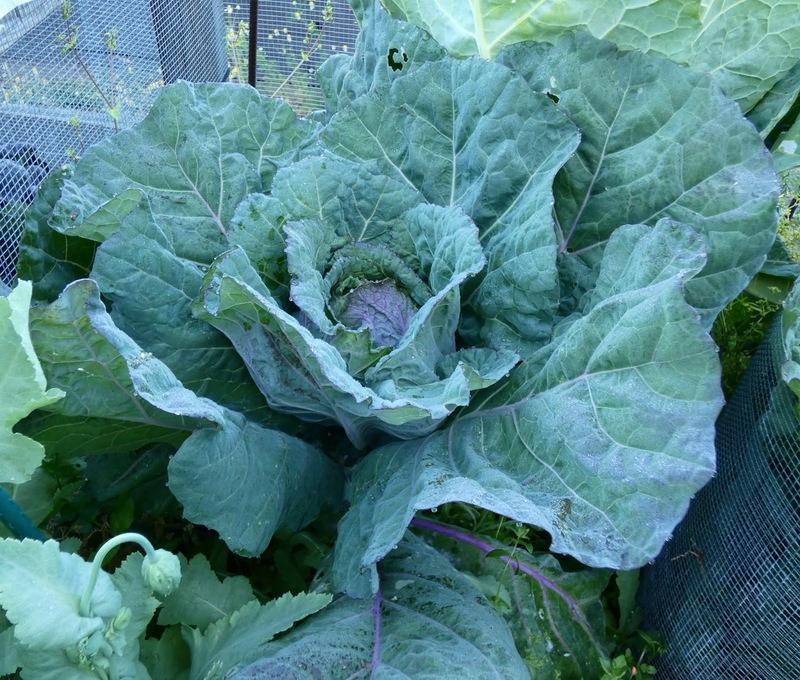 Further down the bed a few Yellow Cabbage Collards are coming back after their run in with a rodent. They are getting to be large enough for me to start harvesting. 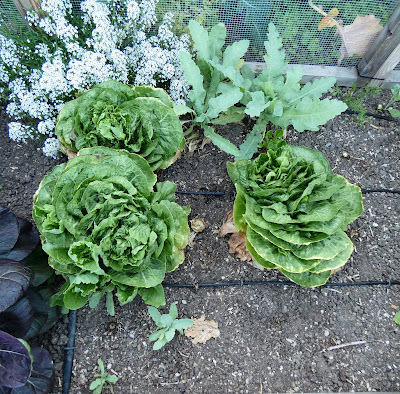 Next down the row are a few decapitated Batavia broccoli plants. Thankfully it was me who decapitated the plants! There are a bunch of side shoots forming now which I should probably sprinkle with some hot pepper powder. 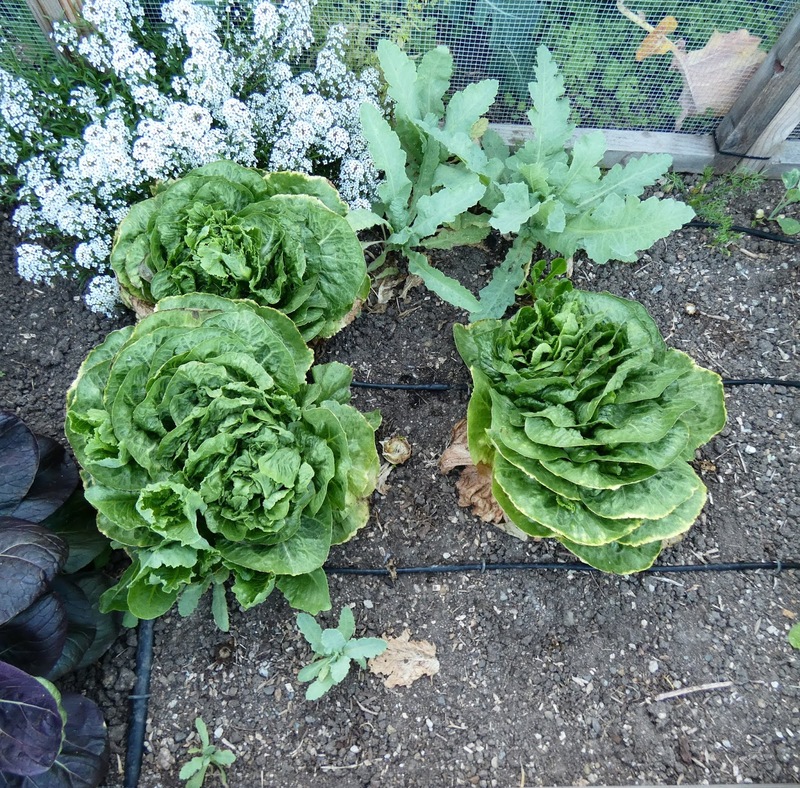 There's a couple of varieties of cabbage that look like they are finally thinking of forming heads. The Syrian Medieval chard is in full bloom now. I could potentially have enough seeds to keep me in chard for years to come with plenty to spare. 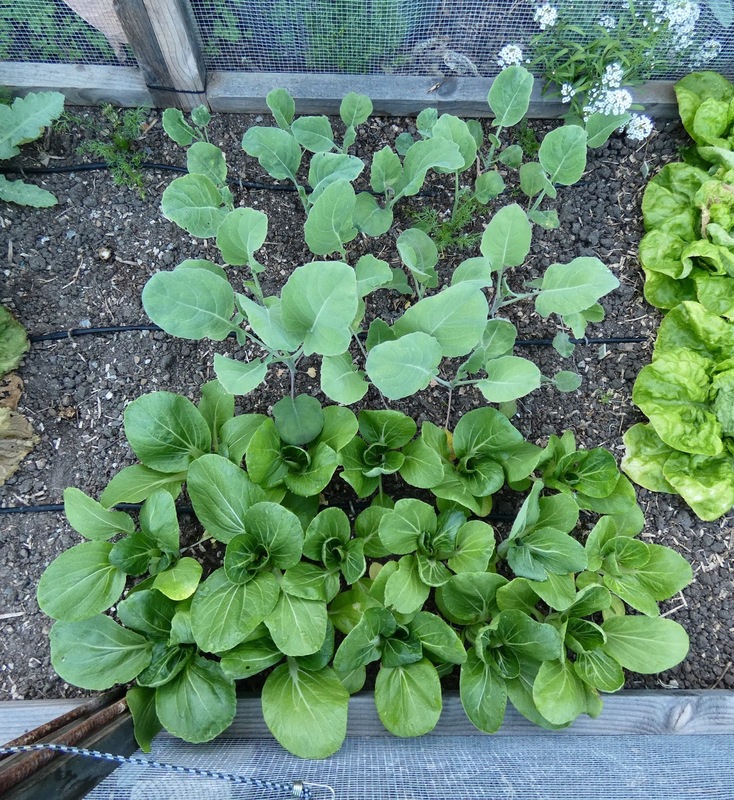 What I don't know is whether or not the rodents like chard seeds. I saw some rodent poop on the screen that covers the cage in front of the chard and there was signs of nibbling on the chard shoots but no serious damage. So far I think that they haven't found the chard to be tasty. The DR's were probably hoping to find tender young ears of corn. Last year they were getting on top of the cages that were next to the corn and were munching on the ears of corn. Sorry effers, no corn this year. More pepper treatment is in order. 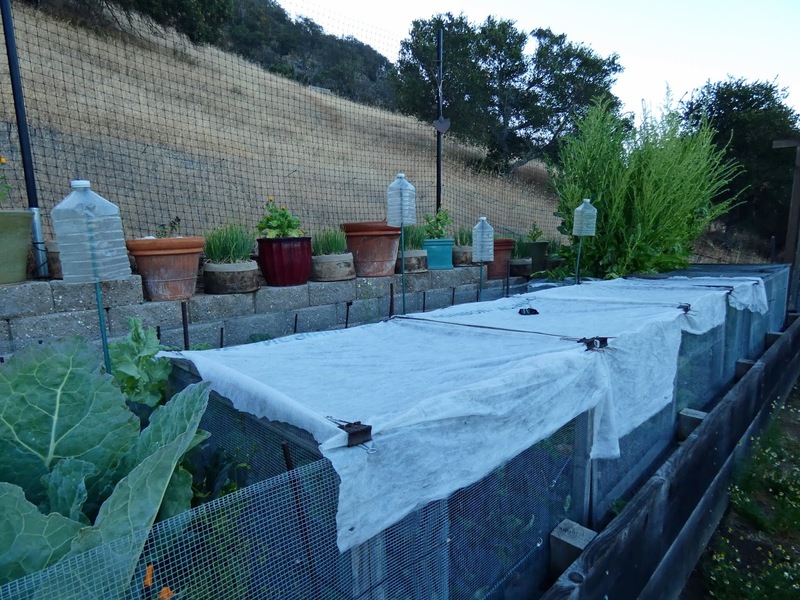 The rest of the veggies in this bed are enclosed in a hardware cloth cage. 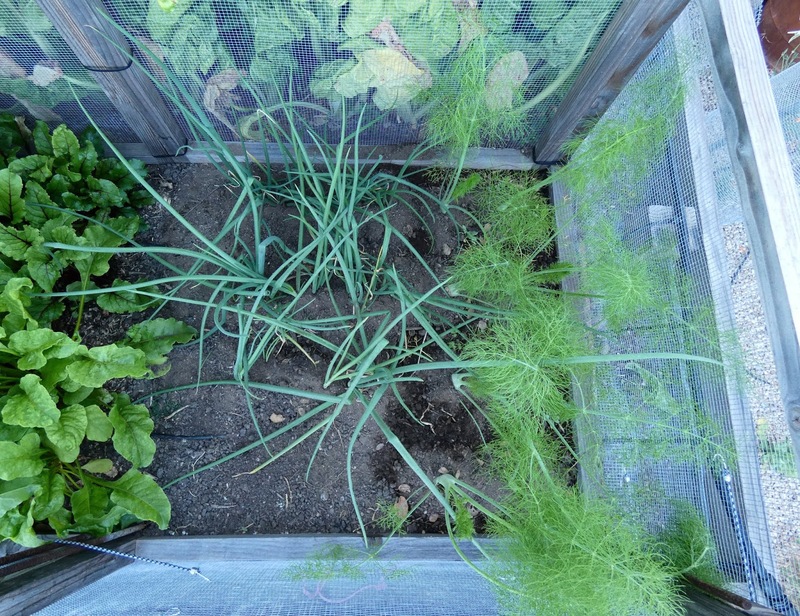 I added some lightweight Agribon fabric to the tops of the cages recently when we had temperatures that exceeded 80ºF and the tender greens inside looked like they were stressed. So, what's inside the cage? Over to Bed No. 3 now. The potatoes are super happy! Me too. Tromba D'Albenga vines are climbing their trellis, cucumber plants are just getting settled in at the base of their trellis. A couple of lingering kalette plants are starting to bloom and I'm allowing them to stay because I don't need their space at the moment and the good bugs like their flowers. 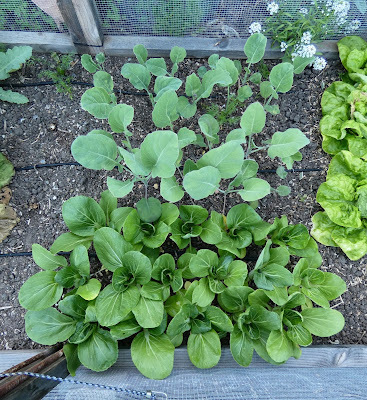 Bolting chard at the lower right need to go. 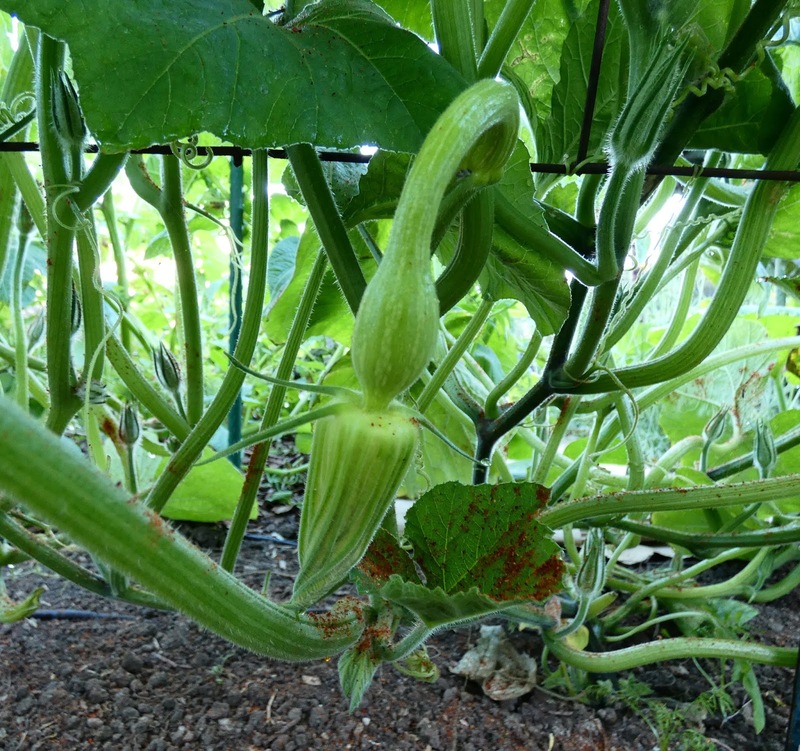 Cucumber varieties this year include 7082 Experimental, Green Fingers, and Little Potato. You can see that I've sprinkled the plants with some hot pepper powder. I also sprayed the plants with hot pepper spray that I make with hot peppers and the cores of hot peppers that I save when I dry or ferment my hot peppers. I whizz the peppers and/or cores with water and then strain out the water and save it in the freezer to be handy when I need it. 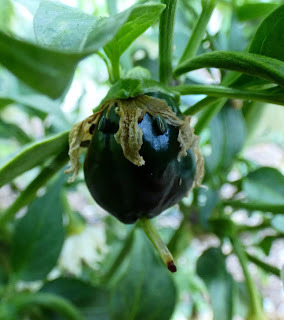 I dry the pulp from the whizzed peppers and use it to sprinkle on plants. I also just pulverize hot peppers to make a more potent powder to sprinkle around. It seems to help. And the Tromba D'Albenga vines have been sprayed and sprinkled with hot pepper powder as well because I found a few young shoots like this one that had been gnawed upon. Damn Rodents. I didn't want the DR's munching on these so they got sprayed and sprinkled too. That photo was taken yesterday and today the flower has opened. Over in this corner of the bed are a couple of remnants from last year. 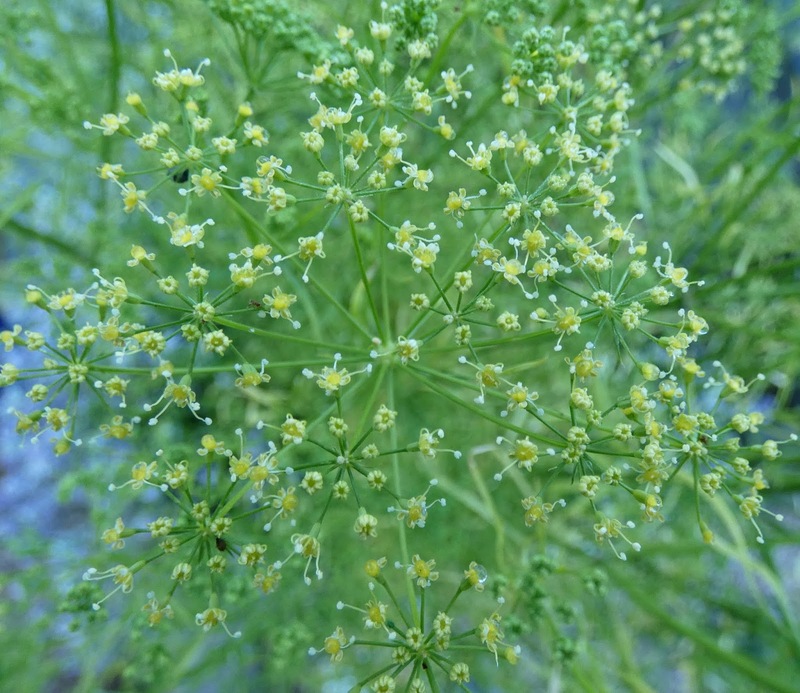 The tall plants are blooming Cilician parsley, seed stock to be. The good bugs LOVE the parsley flowers. In front are some bolting Orion fennel plants which I was going to pull out last week but I gave them a temporary stay of execution. 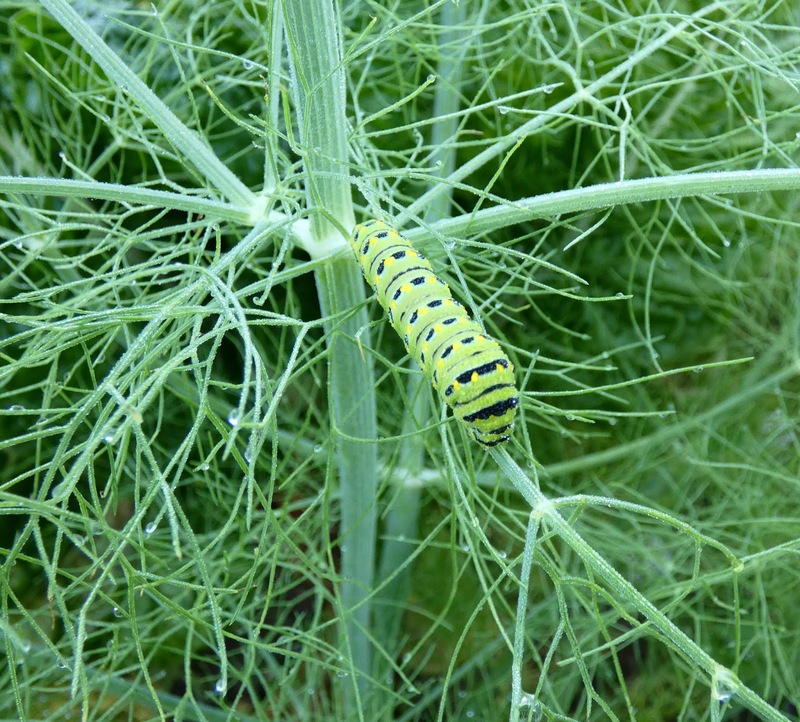 Here's why the fennel got to stay for a while. And let me not forget a few other flowers. The French Blue Belle potatoes are blooming and it looks like they may produce some berries. I hope so, it would be fun to try growing potatoes from seed. Potatoes don't come true from seed but it would be interesting to see what I can get. And one more thing to show in this bed is the basil. 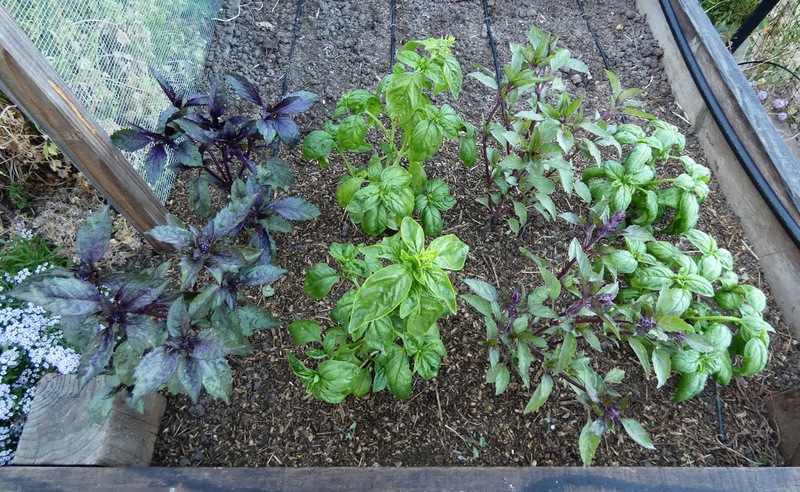 Rodents don't seem to like basil. Yay! Now finally Bed No. 4. I devoted most of the bed to peppers. I would usually run a trellis down the length of one side of the bed upon which I would train tomatoes. This year I decided to limit the number of tomatoes because of the challenge of protecting them from rodents and other reasons. I limited the tomatoes to new varieties that I wanted to try. One variety is a low growing bushy type that is enclosed in the fenced in area with the pepper plants. I placed the others in cages at the end of the bed and the plan is to wrap those cages in hardware cloth. The peppers, 30 varieties and 70 plants, are surrounded by hardware cloth that has been stapled to the inside of the bed. The hardware cloth is low enough for me to be able to comfortably reach into the bed for harvesting and such but I'll be adding taller panels of hardware cloth to make it more difficult for the critters to climb in and it should be possible to cover the bed with fabric if that becomes necessary. The DR's may not appreciate the bite of a hot pepper but they do have a fondness for sweet peppers, especially the seeds inside the ripe peppers. So that's the latest in my garden. It's not quite what I had planned for the year but part of the experience is learning and adapting to whatever challenges come along. 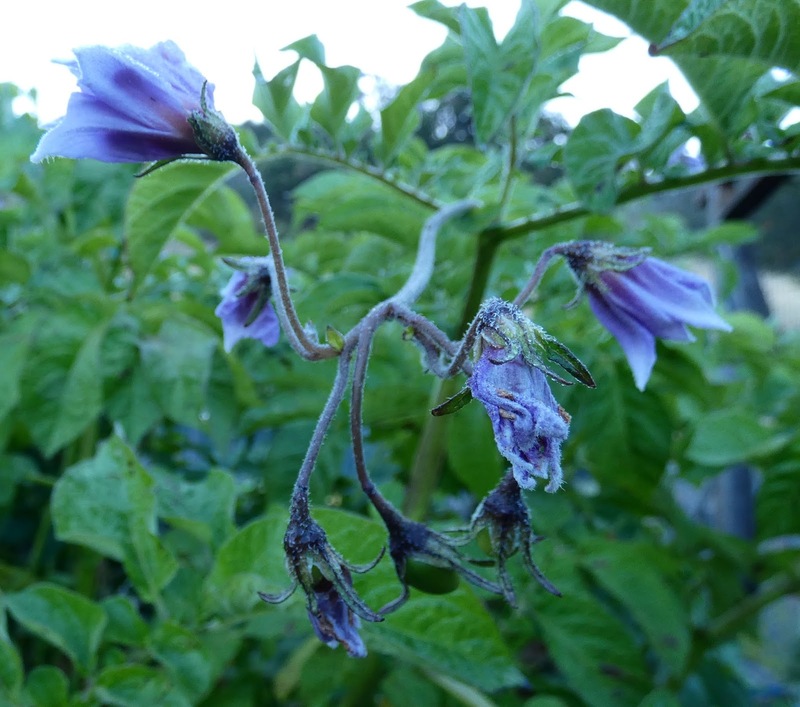 The blue flowers on those potatoes are very unusual. I've not grown potatoes much so I didn't know those flowers are unusual. They certainly are pretty. Your overwintered peppers and cherry tomatoes are impressive, they're packed with blooms. 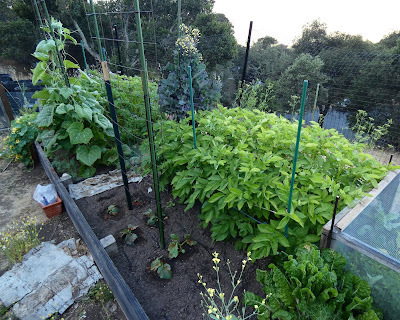 And your potato plants are so bushy and lush. 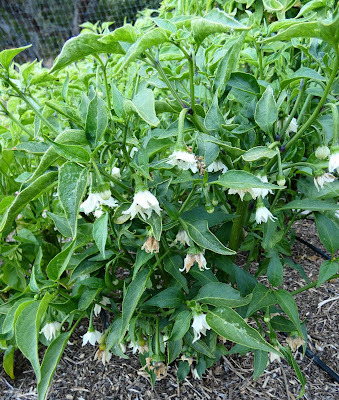 It's so cool that you're raising so many varieties of peppers. I've only seen one pepper set on our plants. It'll probably be close to fall before anymore set. Grind Garlic and green Chillies- Spicy ones ,Strain it and Dilute with water. Can't believe that you are overwintering peppers and tomatoes in your garden - it will be awesome to see how big those plants get in their 2nd year. Fingers crossed the rodents don't get to them. I've been pondering ways of overwintering biennials so that I can start saving seed. If left to their own devices, we don't have much luck getting them through the winter - parsley has only overwintered once since I started growing it. 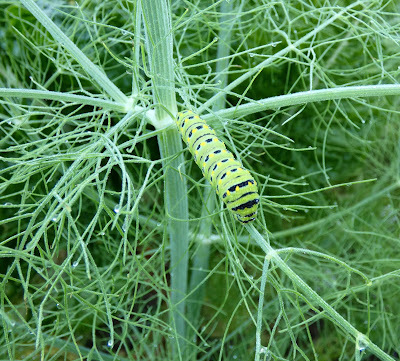 I saw a swallowtail lay eggs on one of my self-seeded dill plants - I've made a mental note to NOT harvest from that one!